At Sarah Beth’s we pride ourselves on offering a bit more than you would expect from many online retailers; we don’t just sell watches, or diamonds, but try to offer our customers the same experience online, as we would want to receive from walking into a shop on the high street. That is why we offer our whole range, from clocks to christening gifts, watches to engagement rings. Every range you see advertised on this site can be viewed in our shop in Rochford, Essex. In addition our experienced team has put together a host of information pages, to offer the same support, advice, and knowledge that you would receive in store. The majority of Sarah Beth’s selection of engagement rings are independently certified for colour, clarity, cut and carat. We believe it is important for customers to have that information to hand, as it can be a hugely expensive purchase, so it is good to know what you are getting for your money. However not all of our rings are certified. Why not? I here you ask. Well it is important to remember that buying a diamond ring is not a matter of science, but of the heart. If you are choosing your ring together as a couple, or as a surprise for your loved one it is not always the grading that matters, but what the ring symbolizes to you both. The engagement ring you choose will last a lot longer than the facts and figures which are often pushed on you, and can be confusing. An engagement ring can be among the most expensive purchases made, and will last longer than the family car, or holiday. It is important to trust the jeweller you have chosen. This is where certificates can be important. A certification should be from an independent source; this stands to reason as it would cast the authenticity into doubt if a shop graded its own stones. At Sarah Beth’s our diamonds are graded by Anchorcert, linked to the Birmingham assay office, which was established in 1773. At Sarah Beth’s we would encourage you to look around, and get an idea of what’s on offer, and where the perfect ring for you is. You will pick up a few bits and pieces about diamond grading, and what to look for. However it’s easy to get confused by the science of buying a certified diamond, and below is a simple guide to choosing the perfect diamond for yourself, or a loved one. To grade a diamond four factors are taken into account, commonly known as the four c’s. But what are they referring to? 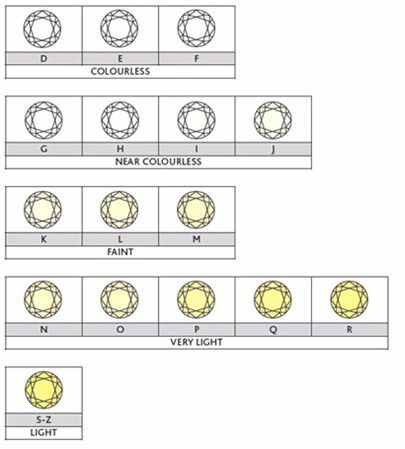 Well the GIA (Gemological Institute of America) have set officially recognized grading charts so there is an industry standard benchmark for determining the colour and clarity of a diamond. Above is the GIA scale for colour grading. D is at the top, and stands for Diamond. A D grade gemstone is completely colourless, or white, in appearance. This means that as the light passes through the stone it is not distorted, and the fire (rainbow coloured sparkle) can really stand out. A white diamond is the rarest, and the higher up the scale the better quality the diamond is. When buying a diamond ring, and the frosty winter white is what you are looking for, aim for a diamond between D-H. D is very rare, and will be hard to find in a diamond of large size, and the price will reflect this. E-F will be hard to distinguish a difference with the naked eye. G-H is a good quality, and any colour is only really distinguishable when comparing to a higher graded diamond. A diamond I-J on the colour scale may have a faint colour present, but when set in yellow metal this will be harder to see. Between K-R colour will be clearly visible to the naked eye, but again, can still look desirable when set in yellow gold. Anything below this is known as a “fancy”. Some celebrities have bought these diamonds into the spotlight, such as Jennifer Lopez’s 6.1 carat Pink diamond ring from Ben Affleck, although at $1.2 million is out of most price ranges! When we talk about colour it is commonly yellow which can be seen, which is a build up of nitrogen when the diamond was formed millions of years ago, but nature has also given us a range of colours, such as Pink, Green, Blue or Orange. The rarest is Red. The diamonds that we buy today were formed millions of years ago completely naturally. Basically a diamond is formed by carbon being compressed in the earth under extreme conditions. It is an imperfect process and, inevitably, most commonly produces imperfect results. Small cracks, a build-up of uncompressed carbon and other minerals will often be found in the diamonds that we see. This means any diamond you buy will be as unique as the person who wears it. When relating this to the GIA clarity grading chart diamonds with less imperfections, or “Natures Footprints,” are considered more valuable. As you can see from the chart, the top grading diamond is graded as FL, or flawless. This is a diamond that has no inclusions at all, and is extremely rare and expensive. The lowest grading is I3; this may also be referred to as P3 or “Pique”. At this grade you will clearly see cloudy patches, black marks and small cracks inside the diamond. Between these two extremes sit the more commonly found diamonds in a high street shop. VS1-SI2 is the most commonly found. It is important to consider, however, where the marks actually are in the diamond. A mark close to the setting, for example, is going to be less conspicuous than a mark on the top of the diamond or in the center. The world’s largest flawless diamond is the “Incomparable” a 407 carat yellow-brown coloured diamond. It is currently on display at the Natural History Museum in Washington DC, although an attempt to sell it on EBay was made in 2002 although, with an opening bid of $15 million, there were no buyers. Cut is quite simply the shape that the diamond cutter chooses to get the best out of the diamond. A mined diamond will be split in half using a process called cleaving, roughly cut to shape and then laser cut and polished. The most popular cut is a round brilliant cut, which allows a diamond to really sparkle. This is the only process in forming a diamond that humans have any say over. Below is a chart of the most popular types of cut. No real advice can be given here as it is very much a personal choice. Please note the chart below is not the definitive list, and there are many different cuts available. The term carat comes from the old fashioned weighing of diamonds where carob seeds were used to weigh a diamond. One carat weighs 0.2 grams. Another way you will see a diamond weight explained is a point system. 100 points equals 1 carat. So a half carat diamond is 50 points, or 0.1 grams. Remember carat is a measurement of weight, and is not directly related to size. A diamond is naturally formed, and then cut to get the most out of it, and so can be short and fat, or long and thin, so two equally weighted diamonds can look different in appearance. Arguably the world’s largest diamond, at 530 carats, is the Star of Africa. This can be viewed at the Tower Of London in the Queens sceptre. N.B. Although we measure gold and silver in the same carat format, weight is not relevant when referring to carat gold. A carat in gold refers to the amount of pure gold present. A nine carat ring has nine parts pure gold and 15 parts other metals, such as zinc or copper. This is to make the gold stronger, and more durable. Below are a few simple steps to bear in mind when buying a diamond. These are all points from our own staff opinions, backed with over 13 years of experience in jewellery retail. • If you are buying the engagement ring as a surprise, don’t worry about finding out the finger size. But do check with the jeweller that they will adjust the size subsequently for no extra charge. • The Clarity, Colour, Carat and Cut are only as good as the setting the diamond is in, and the band itself. Check the quality of the setting and make sure the diamond sparkles. It is no use getting a great deal on a high quality diamond if it falls out of the band after a year or so of everyday wear. • It is often the opinion of jewellers to spend more on Platinum opposed to white gold. White gold undergoes a process called rhodium plating, a coating of a tough substance called rhodium which ensures the finished product looks shiny, opposed to the natural dull yellow of white gold. Unfortunately daily wear will strip the rhodium from the ring, exposing the natural colour of the gold. Platinum, on the other hand is tough, and naturally white, so will never need plating. At first glance this makes perfectly logical sense to buy Platinum, and save money over time. However Platinum is not indestructable, and will still need cleaning and polishing to ensure the longevity of your precious ring. To clean Platinum it is actually MORE EXPENSIVE than rhodium plating a ring. • Platinum is more expensive than gold because it is rarer, and harder wearing. If you took all the platinum in the world and put it in an Olympic sized swimming pool it would barely cover your ankles. Empty all the gold and you would need three olympic sized swimming pools.